The state government has asked farmers not to cultivate paddy because of the lack of water. Srinagar: Farmers in Kashmir are worried these days. In an unprecedented situation, mountain streams in the region have started to dry up, following months of dry weather. This has prompted the government to issue an advisory against the cultivation of water-intensive paddy. Authorities fear the snowless winter followed by a rain deficient in the spring has left too little water to irrigate the Valley’s rice fields this year. The Public Health Engineering (PHE) Department’s assessment is that in the months to come, ensuring drinking water supply in rural areas and peripheries may become a challenge. In such a scenario, the department fears that the diversion of water bodies to irrigate paddy lands could become impossible. It’s a tightrope walk for the government, but it hasn’t got too many options. Leaving the paddy fields barren would push up the food deficit the Valley has been struggling with for many years – not to talk of the economic toll it will take on farmers. The first warning came in the last week of March. Fifty-seven-year-old Abdul Gaffer Dar of Pattan in north Kashmir couldn’t believe his eyes when he found an advisory, asking people not to cultivate paddy, pasted in the main market. “Peoples are advised to refrain from paddy cultivation. We will not able to provide water for irrigation this year,” farmers from the twin districts of Baramulla and Kupwara in north Kashmir were told by the J&K irrigation department. The advisory left Dar, who owns four hectares of paddy land, and many others like him worried. “This is too harsh on the part of the government. What will we do if we don’t grow paddy? Who will feed our children and run our households?” Dar asked. Less than a week later, as the sun continued to shine over Kashmir’s skies, the warning was extended to the farming community of central Kashmir’s Ganderbal district. “There isn’t enough water for paddy cultivation this year. 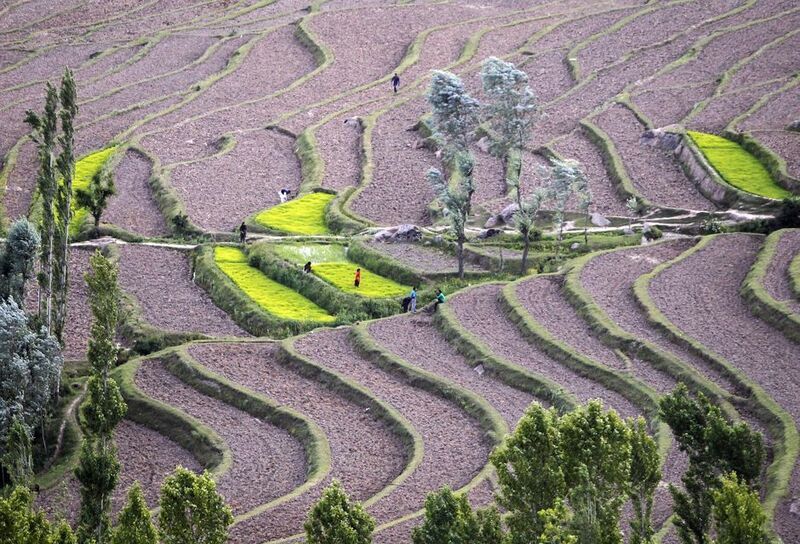 The nallahs and streams have dried up…you should shift to other crops,” read the advisory. The data obtained from the Indian Meteorological Department’s (IMD) Srinagar-based station corroborates the concerns of the irrigation department. Against normal rain and snowfall of 585 mm for four months beginning December, the region has received just 235 mm precipitation, recording a shortfall of more than 50%. Worse, the rainfall received during the past three months has been the lowest ever in the last three decades. To add to farmers’ woes, things aren’t looking encouraging this month either – the month that usually sees maximum rainfall. Today, the discharge in the Jhelum river, a major source of water for drinking and irrigation, is just 1,500 cusecs, compared to the normal discharge of 5,000-7,000 cusecs. Over the years, periods of dry weather and irregular rainfall have increased in the Valley. This has added to the frustration of both planners and the farming community. “Because there has been very less snowfall this winter, the tributaries and nallahs, which ultimately charge the river bodies, are running dry. That is why we are finding ourselves in this peculiar situation,” said chief engineer of the irrigation department Shahnawaz Ahmad, terming the scenario “scary”. In the last decade, Kashmir has seen a mad rush for conversion of agricultural land to other purposes amid a construction boom and unplanned development. As per agriculture department figures, the state has lost an estimated 70,000 hectares of agricultural land in the last ten years alone. This phenomenon has grown at an alarming rate – around 35,000 hectares of this land has been lost in the past six years. 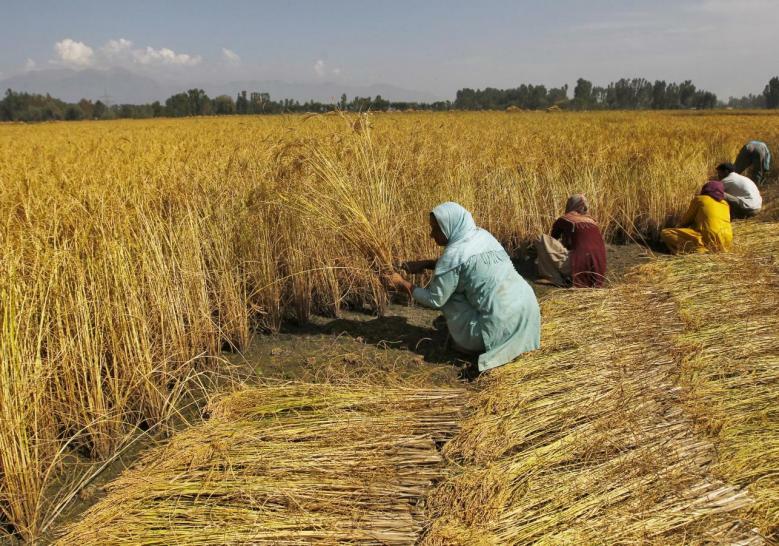 The total land under paddy cultivation in Kashmir today is 1.42 lakh hectares, of which at least 7,500 hectares of land is used for raising paddy nurseries. “More than 80% of our paddy is dependent on canal irrigation drawing water from natural sources like streams, local nallahs and tributaries. This entire system is snow-fed but the dry weather has created an alarming situation,” director of agriculture, Kashmir, Altaf Andrabi told The Wire. The situation is so grim that in north Kashmir, which is spread over three districts, more than 200 water storage ponds which are usually used while developing paddy nurseries are either running dry or left with “bare minimum water”. “The farmers shouldn’t take any decision in a hurry. What if there is no water left for these fields tomorrow?” said Andrabi. The department has already advised farmers to go for other cash crops which are less dependent on water like maize and pulses in districts like Kupwara, Baramulla and Ganderbal. But shifting to other crops would shoot up the food deficit in the region, where rice is the staple food. At present, annual paddy production in Kashmir hovers at around 8.72 lakh tonnes, worth Rs 1,300 crore, as per government figures. Most of this is consumed locally. There is already a deficit of more than 32% foodgrain, which is met through imports from neighbouring states like Punjab. This shortfall will definitely swell, acknowledged Andrabi. “But there aren’t many options for us,” he said candidly. With each passing day, the unease among farmers is growing. They want the government to “somehow” come to their rescue. A young farmer, Shuiab Afzal from central Kashmir, said that shifting to other crops would increase their economic woes. “Most of the farmers produce enough rice not only to take care of their annual requirement but also earn from selling a portion of foodgrains to manage other requirements. What will happen to such families and how is government going to address their concerns?” asked Afzal, mirroring the panic within the farming community. The irrigation department, however, finds itself in a helpless situation. There are around 450 lift irrigation schemes, mainly on the Jhelum, and on some other water bodies like Lidder and Vaishaw in south Kashmir and Ferozpora nallah in north Kashmir. Most of them are lying defunct due to the prevailing weather. A senior official in the PHE said the advisory was a “timely and right call”. The department has been struggling to provide regular supplies to around 82 lakh consumers in the Kashmir division, as more than 40% of its total 1,600 schemes have taken a hit. However, on a larger scale, the prevailing scenario has exposed the government’s failure to create water harvesting infrastructure which many believe would have come in handy today. “The rainfall that we get and the water from abundant glaciers is totally lost in absence of harvesting infrastructure. The time has come for the government to plan for tapping these resources,” said chief engineer of the PHE Abdul Wahid. That could be the answer to weather vagaries in the years to come. But for now, for farmers like 69-year-old Muhammad Sultan of Ganderbal, who has a family of nine to feed, giving up paddy cultivation will mean a struggle in the months to come. He is not worrying about soaring prices of foodgrains in the market and smaller dividends that other crops bring. But there are no answers from the government, at least for now. “It is our duty to caution them (farmers). We don’t want that they should regret and suffer tomorrow if the entire crop fails,” said the chief engineer of the theri irrigation department.